Canadian gardeners are known for their adventurous spirit. Not to climb mountains or hike in a foreign wilderness, but to sometimes introduce new plants in their gardens, year after year. Through the import of seeds and bulbs having come from another continent, settlers have introduced us to cereal crops, vegetables, perennials and even mountain flowers. Long-time residents of the City of Leduc and passionate gardeners, Helen Atkinson and her husband Terry, have enjoyed impressive plants and colorful blooms in their Corinthia home for decades. Their yard is the envy of many loved ones, neighbours and passers-by. Faithful reader of the Pipestone Flyer, Helen was inspired to share with our readers a unique flower that you won’t see very much this fall around our capital region, or anywhere in Alberta, for that matter. Several years ago, Helen was shown photographs of a field of Fall Crocuses by a friend in Teeswater, Ontario. Upon investigating this lovely flower known as a spring flower, she found out that the bulbs that create blue and showy flowers would not grow in Alberta. Creative and ‘adventurous’, Helen ordered her first bulbs from that Ontario grower just to prove that fact wrong, and since a fall five years ago, has successfully grown and enjoyed that lovely splash of color in her fading autumn flower beds. A few years ago, she daringly entered the contest to choose a City of Leduc flower, but her submission of the Fall Crocus arrived after the City had chosen the showy, longer-season burgundy Day Lily. There are now ten Leduc gardeners who have boldly introduced the Fall Crocus in their fall gardens with enjoyment and pride. Helen also shares that there is a Nisku grower who loves this flower, and is planning to sell these bulbs next fall. 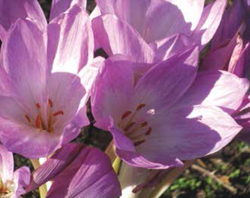 Also called ‘Bare Naked Ladies’, this flower’s bulbs can be planted in the fall and will flower in about 6 weeks. When established, the plant grows extra bulbs that can be moved or left alone in their spot. Helen chose to leave hers alone so that each cluster of flowers would become larger every year. Fall Crocuses will grow in shade, but more sunshine will give them more color and stronger stems, shares Helen. This is just a little story, shared by avid gardener Helen Atkinson that can inspire us gardeners to be a bit daring in the garden, and to not hesitate to introduce new ‘tenants’ in our perennial flower beds. Happy fall yard cleanups and flowerbed preparations, friends!